Volume for last couple of days is becoming very good to show to big exchanges like Bittrex to consider this highly profitable token get listed there. People actually were buying during the last days at extremely cheap and now those are who liquidated their tokens. Believe me they are going to regret for selling so cheap as market will get recover. See other side which is more positive after all some are buying from those sellers. We will see at least $10 soon. Really like Bittrex as an exchange and would use Polo if they were to add either MNE or BAY. Does Bittrex have a request coin form like Polo does? TL/DR - I lost $1480 on MNE in 30 minutes. I bought MNE when it was 0.005 BTC with $2000 USD. 30 minutes later, it dropped to 0.0013 BTC and I lost $1480 USD. :/ My $2000 is now worth $520. Pull the $520 and take the huge hit or do you really think it'll go back up? As shown in the image, you bought MNE when there was a sudden increase of the price (red circle), the tendency was steady, but someone may have tried to raise the price suddenly by buying himself a high price, you should have checked the tendency and wait for the spike to normalize, then if you were paying attention, you could have got the 0.001 price that occurred suddenly (blue circle), so you would have profit right now, you must be careful when to buy or sell and pay attention to the tendency in the graph, and if possible try to fight the price and don't just buy the market, unless you want money and want to sell or buy for direct use, for now just hold your coins, it will be up later, be patient, right now we have surpassed Monero in volume at Livecoin, that's a good indication. The only reason I invested in this token is because it has such a small coin supply. The new "mining" algo is innovative in its own right as well. I bought in at $2.80 and knew 100% I would see the price drop and rise many times. For me this is longterm investment. The value of the token will increase with time and each coin will be extremely valuable. Even though this is an asset, I would like to know what else can be build around it. People should allow the price to rise. Greed is a SIN. write to galaxiekyl by mp he can explain to you. Cool, I think in the coming days the price will be 0.01 BTC. Are you not dreaming? but it is impossible. Its just maybe a FUD or something, but if its not and you really bought it, the best thing is to hold. Even at .005 its still a cheap price. Let's have some facts here. Relevance: 3/10 for me right now, its not yet fully developed, its usage is still on the low range. This is like a double edge sword, at the first days of MNE, when it has no value, it keeps the MNE down, but right now, when it has value already, even more expensive than golem, nem, ripple, and some other top tech coins, it means rating this low is a good thing, because it still have too much room to grow. So its a good buy. It is very undervalued atm, even 10$ is still a good time to buy for this coin, because as you can see, the supply is very limited, but the demand is unlimited. What do I mean unlimited? Furthere developments can attract new investors on the coin, further uses can make the demand high. It means, there is factors that the community can do to increase the demand (unlimited), and its by developing it constantly. Thus, on the supply end, there is nothing that can affect it, it is fix and limited per day. Market cap of all altcoins now is 69$ billion, and MNE is only at nearly 1.2$ million, imagine MNE getting 0.001% only of the market cap of altcoins, around 6.9$ million..the price will increase from 4$ to around 20$ with effect of coin mined per day. And that's only 0.001% if the market cap which is very very likely to be achieved. For me for those who will settle, at current rate, selling at 30$ is the correct price. I will sell at that price. But as I said, as further developments come, my sell order price will also increase as I take it proportionally at its demand as well. All this is just a beginning but one very impressive one. MNE is being bought heavily we can use terminology of accumulation now which will drive the next value. 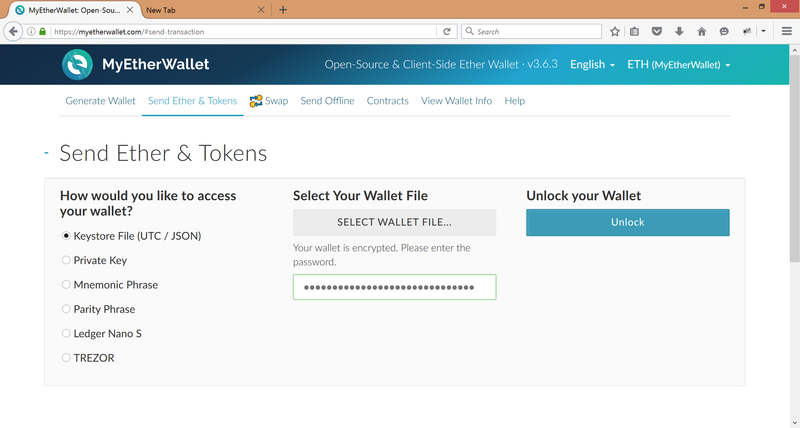 Many people will sell their tokens and after that only 1 token will be generated for each address. Whales will have good control on the available supply to control the market. Keeping your goals for long is really good. 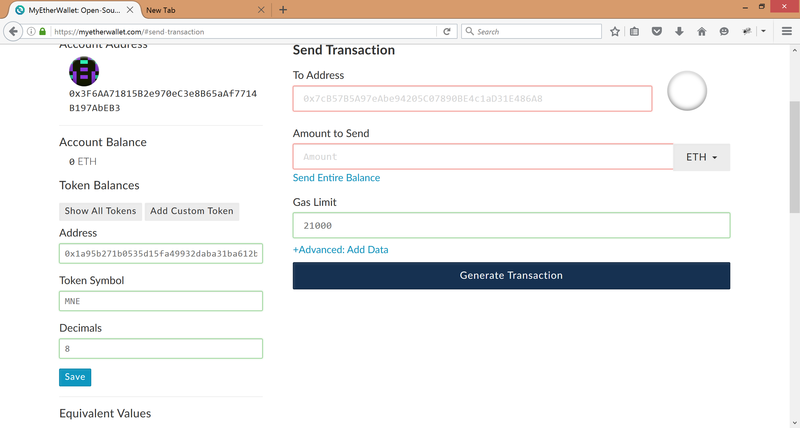 Make an ethereum wallet and then what? 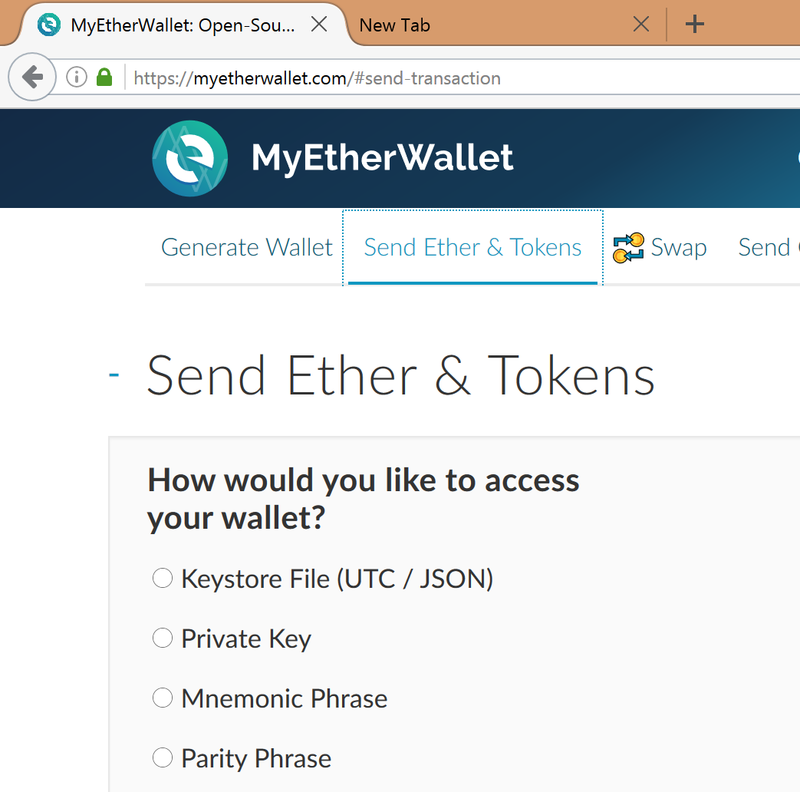 Once you have your wallet, then go to send, choose the keystore option, load your key file and write your password, then Myetherwallet will automatically show the amount of MNE you have, before oyu had to upload the smart contract to do it, but now is already there, so now choose to send MNE not ether, to do so you need to have ether in your account, the fees are called gas, once you have ether, then you can press send to transfer your MNE to another ether wallet. did dev announce there will be more exchangers as well?